Look closely. It’s not a union ride, but it’s entirely awesome. I could extrapolate a buncha snarky puns about boxes and services here, but we try to keep it PG, or at least PG-13, and neither one of those ratings mean anything, at least not in the world of Babe Magnets. This entry was posted on Wednesday, 21 September 2011 at 12:05 AM and is filed under Automotive, Babe Magnet, Bizarre, Cool, Humor, Morons, Odd. You can follow any responses to this entry through the RSS 2.0 feed. You can leave a response, or trackback from your own site. 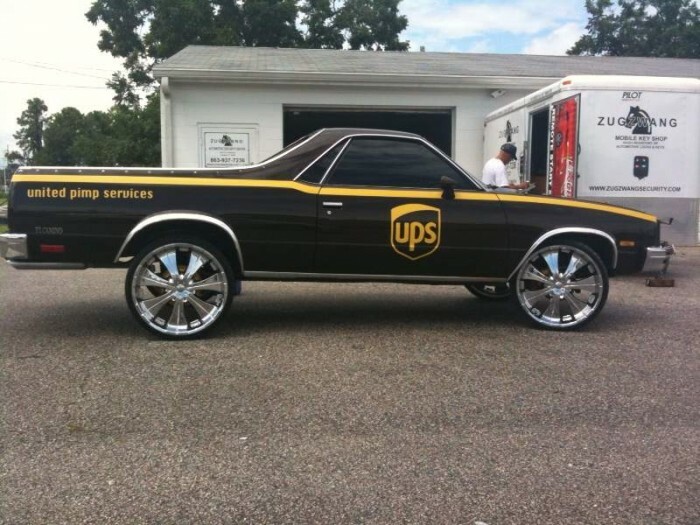 My uncle would totally own that El Camino. LC– Funny. I was about to say the same thing. In honor of this machine, I will have a pack of smokes rolled up in my t-shirt sleeve today.